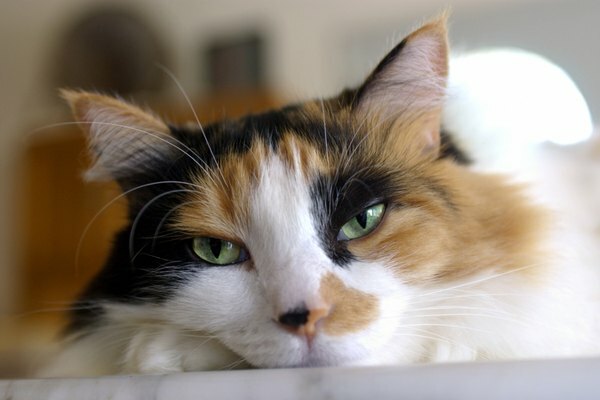 Is Fur Loss a Symptom of Cats With Kidney Failure? Thank goodness it was fleas and not kidney failure that caused my beautiful hair to fall out. If Kitty is losing his hair, he might be suffering from allergies, mange or other diseases -- but he probably doesn't have kidney failure. If his fur looks unkempt and dull, that's another story. Unhealthy hair is just one of many symptoms of kidney disease, which affects many older felines. Kidney failure, or renal failure, in cats can come on suddenly or it can progress over time. Acute renal failure might occur if Kitty consumes a poison such as antifreeze or if an untreated urinary track blockage causes his kidneys to shut down. Unlike acute renal failure, chronic renal failure usually occurs in older cats. Your vet diagnoses kidney failure through urine and blood samples, along with X-rays or ultrasounds. Cats suffering from kidney failure generally drink a lot of water and pee a great deal. If your cat starts flooding the litter box regularly, take him to the vet. You might also see blood in his urine, or he could start having urinary "accidents" and going outside of the box. His breath might smell bad as he develops mouth ulcers. Kitty may lose interest in food and throw up a lot. Cats with kidney failure can exhibit weight gain or weight loss. Although he might not actually lose hair, his coat quality declines. If a cat in acute kidney failure receives early emergency treatment, he might make a good recovery. Much depends on what caused the problem in the first place. Although chronic kidney disease can't be cured, certain measures and medication can provide Kitty a good quality of life as well as prolong it. Your vet will recommend a special diet for Kitty that doesn't overly tax his kidneys. He might receive IV therapy to keep him hydrated. If money is no object and your vet believes your cat is a candidate, a kidney transplant can restore kidney function. Generally, the donor kidney comes from a shelter cat that you must adopt as part of the bargain. The good news is that if Kitty's only symptom is hair loss, he probably doesn't have kidney disease. So then what is wrong with him? He might be allergic to something. Your vet will conduct blood tests to determine what triggers allergic reactions in Kitty. If he has a food allergy, a change of diet could bring his hair back. Flea allergies usually clear up if you use a topical monthly flea preventative. Other allergens might require regular shots for symptom control. Besides allergies, hair loss might be the result of fungal or other skin infections. Your vet can take skin scrapings to determine the cause. While hair loss is a symptom in other diseases, such as hyperthyroidism, it's seldom the only one. What Are the Causes of Seizures in Kittens?